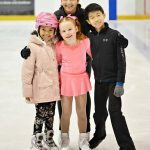 How Old Should My Child be to Start Ice Skating? Attention Span – most group classes will last 30 minutes. Separation from parent – Separation anxiety is still developmentally appropriate until approximately age four. If your child can be comfortable accepting instructions from another adult, then you should be fine. Balance – both in skates and in regular shoes. My recommendation is to start with your child walking in skates on the floor only. If this goes well, then your child is physically ready. Check with your local ice rink for age requirements. Many rinks will not accept children for group classes who are under 4 years of age. If your child is eager and can meet the basic criteria before he is 4 years old, you may consider private lessons. They are more flexible with the length of lesson and can adapt to the age of the child. To ensure quality instruction, make sure to ask for a Professional Skater’s Association rated instructor.